The Erle Montaigue System On this series, Erle Montaigue presents his "Sudden Violence" method of fighting. This series presents the raw, deadly and extremely violent fighting methods necessary for any realistic confrontation. If you do not have 'Animal Violence" then you will lose. "Animal Violence" is not being 'angry' as anger will only cause you to be defeated. Violence in fighting is a sub-conscious reaction to a survival situation where we are able to go into the Reptile Brain part of our brain sub-consciously in order to survive in just the same way that any animal does. On the other side of the coin, "Sudden Violence" also teaches us how to heal as all of the prerequisites necessary for self-defense using "Sudden Violence" are also necessary for the two area of healing; healing others and healing ourselves. Here, Erle presents the pure mechanics of violent fighting showing very dangerous and violent fighting methods, never giving a sucker an even break! If you can hit him once, then hit him ten times! In two sections, Erle presents firstly on this tape some of the 'centrifugal' Sudden Violence methods. These will continue in to volume two and then he will present the 'Straight Line' methods. Although the straight line methods are also circular, they contain very small circular movements and so are not as easy to learn as the purely centrifugal methods. Obviously, you cannot learn the Erle Montaigue system of 'Sudden Violence' without having some knowledge of Dim-Mak, so Erle also explains exactly what points you are striking and the correct directions and pressure (usually full on!). 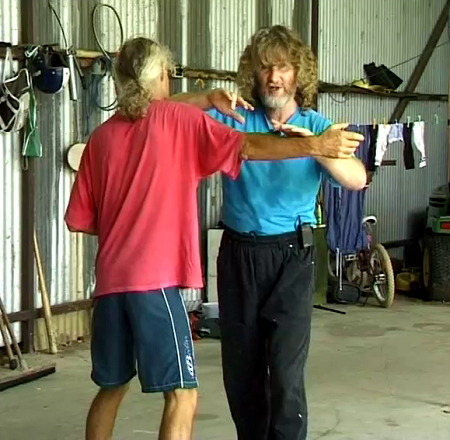 Anyone can learn the extremely street oriented method of 'Sudden Violence", however, those who have some knowledge of the Internal Principles of 'Sung', 'Fa-Jing' and 'Continuous Flowing Movement' will learn quicker. In many cases these methods have changed the stiffer types of martial art to a more flowing system which is what we need in the street if we are to survive. As usual, This series is filmed while Erle is in full teaching mode so that every tiny area will be covered by seeing what the students are doing wrong and correcting them on camera. The book called 'Reflex Violence' which represents this series is also available online along with Erle's other published works.